Perfection of Wisdom is a translation of the Sanskrit term prajñā pāramitā (Hanzi. 般若波羅蜜多, Pinyin. bān ruò bō luó mì duō, Jp. hannya-haramita), which is one of the aspects of a bodhisattva’s personality called the paramitas. The Perfection of Wisdom Sutras or Prajñāparamitā Sutras are a genre of Mahayana Buddhist scriptures dealing with the subject of the Perfection of Wisdom. The term Prajñāparamitā alone never refers to a specific text, but always to the class of literature. The earliest sutra in this class is the Aṣṭasāhasrikā Prajñāpāramitā Sūtra or «Perfection of Wisdom in 8,000 Lines», which was probably put in writing about 100 BCE. More material was gradually compiled over the next two centuries. As well as the sutra itself there is a summary in verse, the Ratnaguṇasaṁcaya Gāthā, which some believe to be slightly older as because it is not written in standard literary Sanskrit. 8,000-line is one of the earliest Mahayana sutras. Between 100 and 300 this text was expanded into large versions in 10,000, 18,000, 25,000 and 100,000 lines, collectively known at the «Large Perfection of Wisdom». These differ mainly in the extent to which the many lists are either abbreviated or written out in full; the rest of the text is mostly unchanged between the different versions. Since the large versions proved to be unwieldy they were later summarized into shorter versions, produced from 300 to 500. The shorter versions include the Heart Sutra (Prajñāpāramitā Hṛdaya Sūtra) and the Diamond Sutra (Prajñāpāramitā Vajracchedikā Sūtra). These two are widely popular and have had a great influence on the development of Mahayana Buddhism. Tantric versions of the Prajnaparamita; literature were produced from 500 on. The following is a quotation used with permission. 1) One should become a bodhisattva (or, Buddha-to-be), i.e. one who is content with nothing less than all-knowledge attained through the perfection of wisdom for the sake of all beings. The central idea of The Perfection of Wisdom is complete release from the world of existence. The Perfection of Wisdom goes beyond earlier Buddhist teaching that focused on the rise and fall of phenomena to state that there is no such rise and fall — because all phenomena are essentially void. The earlier perception had been that reality is composed of a multiplicity of things. The Perfection of Wisdom states that there is no multiplicity: all is one. Even existence (samsara) and nirvana are essentially the same, and both are ultimately void. The view of The Perfection of Wisdom is that words and analysis have a practical application in that they are necessary for us to function in this world but, ultimately, nothing can be predicated about anything. Stars cannot be grasped. Things seen with faulty vision do not really exist. Lamps only burn as long as they have fuel. A mock show is a magical illusion; it is not as it seems. Dew drops evaporate quickly in the heat of the sun. Bubbles are short lived and have no real substance to them. Dreams are not real, even though they may seem so at the time. Lightning is short lived and quickly over. Clouds are always changing shape. By realising the transient nature of things it is easier to detach from them and to attain Nirvana. Nagarjuna‘s philosophical explorations of śūnyatā may be derived in part from the Prajñāparamitā literature. Conze, Edward Perfect Wisdom; The Short Prajnaparamita Texts , Totnes. 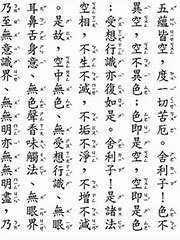 (Luzac reprint) Most of the short sutras: Perfection of Wisdom in 500 Lines, 700 lines, The Heart Sutra and The Diamond Sutra, one word, plus some Tantric sutras, all without commentaries.